Looking over the books I've gotten in the past few weeks, only four can't be classified as historical fiction. Good thing it's my favorite genre! 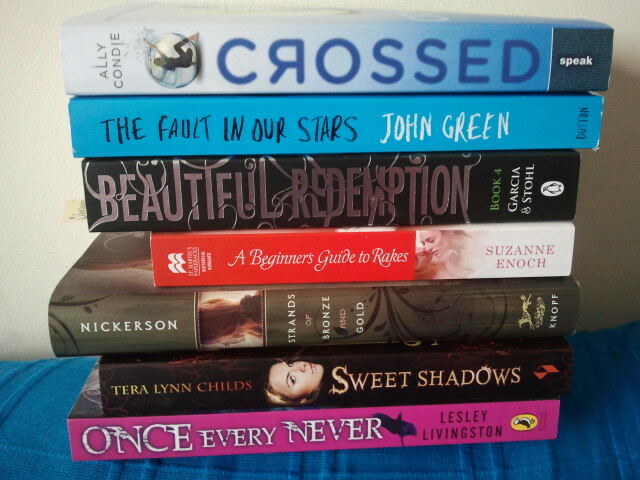 It's been a good time in my reading life lately. -Bad Girls Don't Die by Katie Alender: so creepy! A bit like YA Stephen King. -The Unbecoming of Mara Dyer by Michelle Hodkin: LOVE. I read this in a few hours. SO GOOD. -Roses HaveThorns by Sandra Byrd: I'm excited for this one, I love Elizabeth I! -The Queen's Rivals by Brandy Purdy: I've heard nothing but good things about this author so I can't wait to start this! 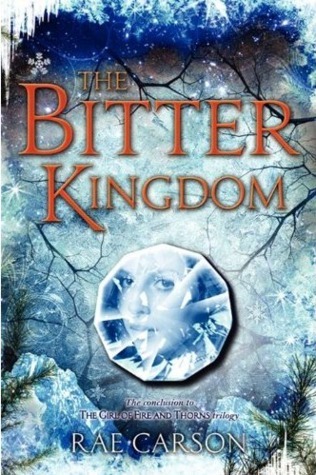 The Bitter Kingdom by Rae Carson: I love, love, LOVE this series and The Bitter Kingdom was a perfect ending, but now I'm sad I won't be going on adventures with Elisa anymore... But you should all read it!! -Hopeless by Colleen Hoover: this sounds REALLY intense and slightly creepy! -It Happened One Midnight by Julie Anne Long: I love the Pennyroyal Green series and Julie Anne Long's writing in general, these books make me happy! -An English Bride in Scotland by Lynsay Sands: there is just something about lairds. -No Angel by Helen Keeble: this will be either REALLY good or really bad, I'm counting on the first. -Find Me by Romily Bernard: I will be so creeped out by this book and it will be awesome! -The Burning Sky by Sherry Thomas: ALL THE EXCITEMENT! This sounds like such a me-book! -Twinmaker by Sean Williams: because who hasn't dreamed of an easy way to improve your appearance? I'm curious to see the nasty effects this has! -The Chaos of Stars by Kiersten White: I've heard pretty much nothing but good things about her books and this one has EGYPTIAN GODS in them! Be still my mythology-loving heart! -Blackout by Robison Wells: a mysterious virus infecting teens with impossible powers, YES I'm all over this! -Don't Look Now by Michelle Gagnon: described as the teen version of The Girl of the Dragon Tattoo, it sounds really good! -False Sight by Dan Krokos: I LOVED False Memory and can't wait to continue this series! -Beauty and the Blacksmith by Tessa Dare: a Spindle Cove novella, I've fallen in love with Tessa Dare's writing. -Hideous Love by Stephanie Hemphill: it's about Mary Shelley and sounds just fascinating! -Prophecy Girl by Cecily White: this sounds like a fun paranormal romance series! -Crossed by Ally Condie: I haven't read Matched yet, but I will soon! And then this one! -Beautiful Redemption by Kami Garcia and Margaret Stohl: I still need to start this series but it bugged me that I didn't have the final book. -Strands of Bronze and Gold by Jane Nickerson: a retelling of Bluebeard, the fairytale that gave me nightmares, I really want to love this, I've heard mixed things about it though..
-Sweet Shadows by Tera Lynn Childs: I really enjoyed Sweet Venom and am looking forward to continuing this series! -Once Every Never by Lesley Livingston: I won this in a giveaway by my lovely blogging buddy Karin from My Life..., thank you so much! I'm really excited to read this! Oh, and if you're looking to add to your haul, I'm having a giveaway for a boxed set of The Infernal Devices series by Cassandra Clare over my personal blog Between the Pages, open to US, Canada and UK residents! Fantastic haul this week! I'm always really excited for Roses Have Thorns. The Queen's Rivals is a new title to me but is definitely going on my list!! Blackout and Hideous Love both sound amazing. Happy Reading! 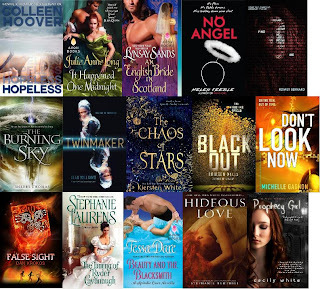 OMG, I want to read pretty much everything in Kelly's stack! I can't wait to see what you think of all those books. Happy Reading! Haha ;) I will soon! Wow ladies, these hauls are amazing! So many awesome books that I'd like to read at some point as well! That's a fabulous haul! So many books, so little time. Happy reading!